AGS 10 Flex Templates and Flash Builder 4, what does it mean for your existing Flex Application? Now that ESRI has officially released ArcGIS 10 there is both the need and desire to download and use the latest and greatest Flex API and Template. The ESRI Flex 2.0 API is based on Flex 4 which is most readily available in Adobe’s new Flash Builder 4 (formally Flex Builder 3). 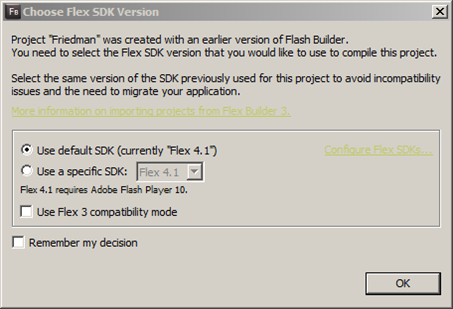 It is possible, and very doable, to bring Adobe’s Flex 4 sdk in to Flex Builder 3 but it is extremely easy to import a Flash Builder 4 project into Flex Builder 3. It has been decided that Flash Builder 4 will now be the IDE where all Flex/Air development will take place. The latest ESRI Flex Template can be downloaded here. Once downloaded, getting the latest template into Flash Builder 4 is exactly the same as it was in Flex Builder 3. But the issue is not how to use the latest template, rather it is how are all the legacy projects (the ones created in Flex Builder 3) will be incorporated into the new IDE. Don’t worry, Adobe has made importing legacy projects very easy in Flash Builder 4. 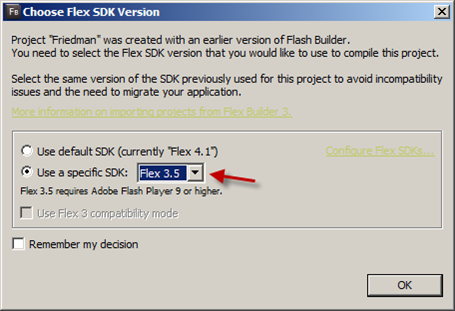 Flash Builder 4 is shipped (or downloaded) with both the latest Flex 4 and Flex 3 (3.5) sdk’s. 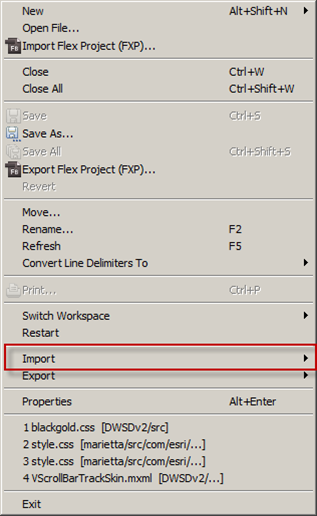 Find the legacy project going to be imported in Flash Builder 4 and go to File -> Import and navigate to the correct project (either as a project folder or .zip project archive file). Choose the project going to be “upgraded”. Once Flash Builder has had a chance to review the project it will display a form asking what sdk the project should be based on (Flash Builder recognized the legacy project was created in Flex Builder and was based on a sdk other than 4.0). Choose the specific sdk the project was based on, for this example the Flex 3.5 sdk was chosen (remember, the 3.5 sdk is pre-installed with Flash Builder 4 but it is possible to add additional sdk’s to Flash Builder in the same manner as Flex Builder). Once the specific sdk is chosen Flash Builder 4 will update the workspace and recompile the project. There is one last step, after the project has been recompiled to the sdk Flash Builder 4 will show a screen displaying information that the project will be upgraded and will no longer be able to be used in previous versions. After saying “OK” to the upgrade the Flex Builder 3 project is ready to be manipulated/debugged/whatever your fancy in Flash Builder 4. Enjoy!